Built in 1970 by prolific Cape Cod–based architect Charles Zehnder, the Frank Lloyd Wright–inspired Kugel Gips house spent nearly a decade unoccupied and in disrepair while under ownership of the National Park Service (NPS). 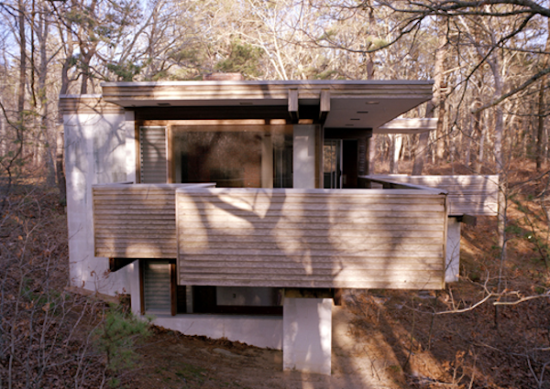 Abandoned and rotting, the compact Modernist home was nearly lost to the idyllic peninsula’s salty winds, and worse yet, the wrecking ball, until Wellfleet, Massachusetts–based architect Peter McMahon and the Cape Cod Modernist Trust (CCMT) stepped in. As part of their mission to preserve and document the Cape’s rich Modernist heritage—a legacy of 80 homes by local and European-born architects like Marcel Breuer, Serge Chermayeff and Nathaniel Saltonstall—McMahon and a group of around 35 volunteers have faithfully restored the house, opening it up to visitors, vacationers, scholars, and artists. 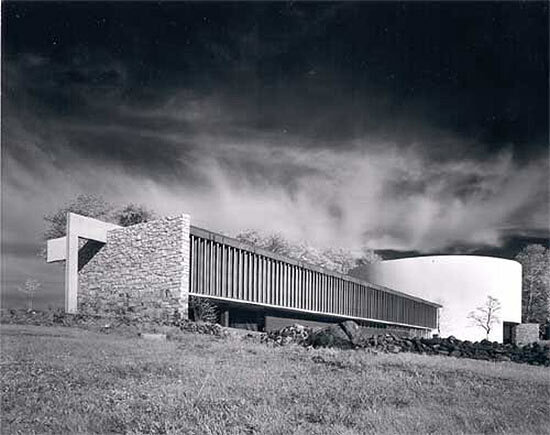 Following the outbreak of World War II and their subsequent migration to New England, seminal Bauhaus figures like Walter Gropius and Marcel Breuer were drawn to Cape Cod by its pristine natural environment, cheap, undeveloped land, and the open minds of the local artistic and architectural community. On parcels costing as little as $1,000, architects constructed simple, experimental summer cottages with budget materials and intimate connections to their natural surroundings. “The designs were very intentional,” CCMT founder McMahon told the Boston Globe in 2009. “There’s a lifestyle implied by these buildings, one that recognizes the importance of nature, creativity, and sustainability, one that says you don’t need a lot to be happy” Featuring a large cantilevered roof, exposed concrete, wood shingles, two decks and gracious windows overlooking a nearby kettle pond, the 2,200-square-foot, three-bedroom house is the first restoration undertaken by the CCMT. Commissioned by Peter and Judy Kugel, both Boston academics, the house was built within the boundaries of the Cape Cod National Seashore and in 1998 was acquired through eminent domain by the NPS for $80,000 before falling into disrepair. Thanks to a generous $100,000 contribution from the town of Wellfleet and the pro bono services of Manhattan based Fox Diehl Architects, along with the sweat of McMahon and his volunteers, the home now looks as good as it did 43 years ago. Seven such Modernist homes are owned by the NPS, five of which were in poor condition and scheduled for demolition before the Massachusetts Historical Commission deemed them significant specimens of postwar Modern residential architecture. The CCMT has since acquired long term leases on the five properties and plans to make them available for educational programs, summer rentals, and scholar and artist residencies. Over the summer, the CCMT completed renovations of the Jack Hall-designed Hatch cottage, and in October the organization raised over $60,000 via Kickstarter for the restoration of the Weidlinger house, designed Hungarian Modernist Paul Weidlinger. According to the CCMT, Gropius, Breuer, and Le Corbusier all weighed in on Weidlinger's design, with Corbusier reportedly commenting "don't pave the driveway." But it is not the publicly owned properties that are in real danger. Times have changed and land prices have escalated since Breuer built his pair of houses on the Cape for $5,000 each. For many would-be residents, the modest scale and off-the-shelf materials of these mid-century relics are not worth saving when a beachside McMansion would fit nicely in their place. 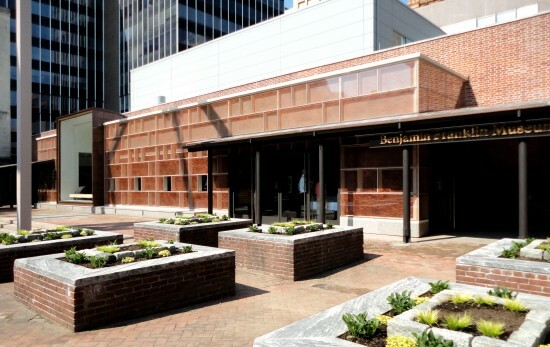 The Benjamin Franklin Museum at Independence National Historical Park (INHP) in Philadelphia has bid adieu to the 1970s. Closed by the National Park Service (NPS) for a $23 million, two-year renovation, the historic site has re-opened as an 8,000-square-foot, state-of-the-art facility to learn about the “relevant revolutionary.” Quinn Evans Architects (QEA) was tasked with renovating the original 1976 underground museum designed by Robert Venturi and Denise Scott Brown (VSBA). The museum now involves interactive displays, personal artifacts, and a glass pavilion, also known as the ghost house, operating as the main entrance from Franklin Court. While VSBA’s "ghost house" pavilion remains largely untouched, one major change consists of the new entry building, which replaces heavy brick walls with a ground floor facade of “fritted glass,” a pattern created from photographs of the original pavilion’s brick wall. Slate floors replace burnt orange-tiled passageways. The firm has also designed a large “View Window” to engage visitors with the ghost house, a steel structure outlining Franklin’s vanished residence and print shop. While recognizing that the museum could benefit from an update and the expanded entry pavilion might be needed to accommodate roughly 250,000 annual visitors, Scott Brown was not thrilled that VSBA was not asked to carry out the project. When the project began, AN reported that Doris Fanelli, chief of INHP’s Division of Cultural Resources Management, contended that the NPS selected QEA from a pre-approved list because the venture was progressing quickly. Although confronted with reluctance from architectural scholars to alter the postmodern icon, NPS did not approach VSBA, who was not on the list. In a letter, VSBA wrote that more offensive is how the alterations rework the museum entry experience, which resembled former urban planner Edmund Bacon’s greenway plan for Society Hill. After years of litigation, preservationists have lost the battle to save Richard Neutra’s Gettysburg cyclorama building, an iconic example of modern architecture from the 1960s. The bulldozers could raze this circular visitor center as early as February, the Philadelphia Inquirer reported. The National Park Service commissioned the glass and concrete building as part of its Mission 66 initiative—a billion-dollar program to update park services across the country—at the Gettysburg Battlefield site. The rotunda was designed specifically to house the 1883 panoramic painting of the Battle of Gettysburg by Paul Philippoteaux. Modern architecture preservationists and Civil War buffs clashed over the future of the building, which resulted in legal action that required the National Park Service to conduct a review of the demolition and explore alternative solutions. But when Paul Philippoteaux’s painting was relocated to a new visitor center, the fate of Neutra’s building seemed sealed. The National Park Services released its report this past September and determined that there was no other alternative but to tear the building down. The Gettysburg Foundation will pay for the $3.8 million demolition. Parks for the People The Octagon Museum 1799 New York Ave. NW, Washington, D.C. Through November 30 Parks for the People presents student ideas of how to reimagine our national parks as natural, social, and cultural destinations. 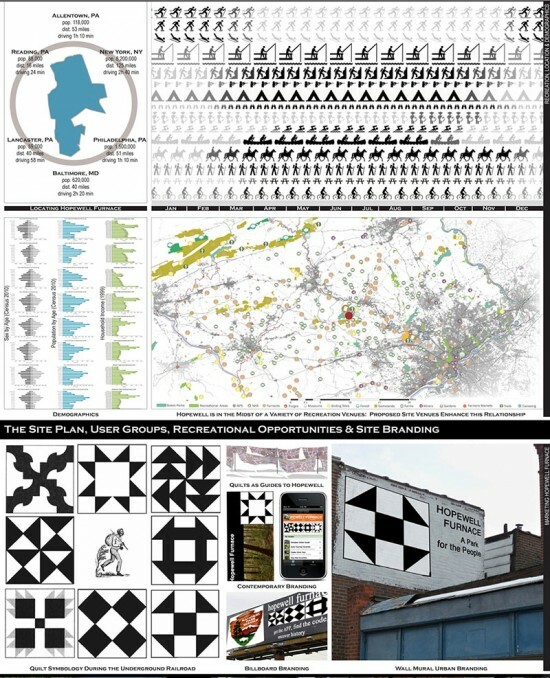 Teams from City College of New York, Rutgers, Cornell, Florida International University, Kansas State, Pratt, the University of Pennsylvania, and the University of Washington competed in a semester long studio, engaging questions of the preservation, sustainability, accessibility, and technology in 21st century national parks. The National Parks Service, Van Alen Institute, and the National Parks Conservation Association sponsored the competition, which ultimately declared the teams from City College, for their work on the Nicodemus National Historic Site in Kansas, and Rutgers, for their project at the Hopewell Furnace National Historic Site in Pennsylvania (above), the winners. All seven entries, each representing a different region of the country, will be on view at the Octagon Museum in Washington, D.C. Solar Decathlon Booted From the National Mall? 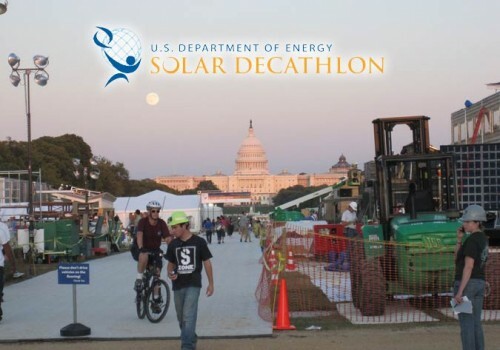 In support of the historic effort underway to protect, improve, and restore the National Mall, the Department of Energy, in conjunction with the National Park Service, has decided to seek a new site for the U.S. Department of Energy Solar Decathlon 2011. With only eight months remaining until the competition, we will face an insurmountable challenge to alter the designs, already in advanced stages, for installation in an as-yet unknown location. In addition, the considerable effort made to source materials and equipment for our solar-powered homes from local manufacturers and, in some cases, to engage the D.C. community in the afterlife of the structures may be for naught. There's also a Facebook page dedicated to keeping the Decathlon on the Mall, including email addresses for Secretary of Energy Steven Chu and Secretary of the Interior Ken Salazar. "We've been working on this project for over a year and a half," Reed Finlay, Project Manager of SCI-Arc and Caltech's entry, told AN's Sam Lubell. Their project, CHIP 2011, which includes a snug wrapping of vinyl over cellulose insulation, canted rooftop PV panels, and a sloping cantilever (previously) meant to highlight a view of the Washington Monument, has involved 60 students and over $100,000 in donations. "The Mall gives exposure and credibility to what we're doing... They don't know who they're messing with," he added. "I think they'll be surprised with the backlash." It’s odd when the symbol of a building becomes more important than the structure itself. That’s certainly the case with the newly completed President’s House in Independence National Historic Park in Philadelphia. George Washington and John Adams lived there when the city was still the nation’s capitol. Unlike Independence Hall, The President’s House didn’t garner importance over time. Actually, there wasn't a physical structure left, just ruins hidden below ground a few feet from the entrance to Liberty Bell Center and discovered in 2002. Initially, the National Park Service did have plans to commemorate the site. Then scholars, including UCLA-based historian Gary Nash, pointed out the significance of the fact that Washington kept seven slaves so close to the nation's sacred symbol of liberty. Consistent reporting by The Philadelphia Inquirer’s chief culture writer Stephan Salisbury kept a harsh spotlight focused on the debate over the years. On Wednesday of last week, the memorial with the ungainly name, The President's House: Freedom and Slavery in the Making of a New Nation, opened to the public. 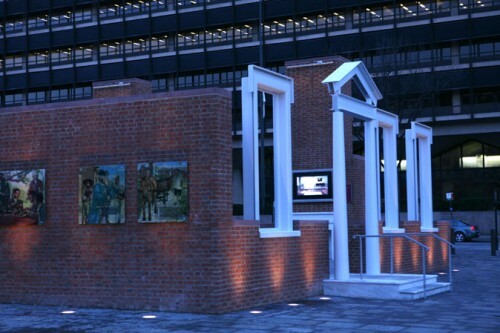 The Kelly/Maiello-designed memorial received tepid reviews from The Inquirer’s Inga Saffron and the New York Times’ Eduard Rothstein. Criticism honed in on the too many cooks in the kitchen aspect of the design, which left the memorial lacking clarity and depth. Over the past few years, an overhaul of Independence Mall attempted to provide a museum without walls aspect to the park and the new President’s House does its part by remaining open to the elements. Access to the site is 24-7. A series of red brick monoliths punctuate the small area and inferred walls define the perimeter. White marble strips in the slate floor suggest interior walls, as do low redbrick walls that double as benches. The monoliths represent chimneys, which on entering house become a series of hearths, complete with a digital “paintings” hung above marble mantles. The monitors are supposed to feature videos with slave narratives, but they function sporadically. At the facade of the building facing Market Street three white window frames and an entrance portico float free of the structure. Near the middle of the site a glass cube, like a miniature Apple store, rests above the ruins. 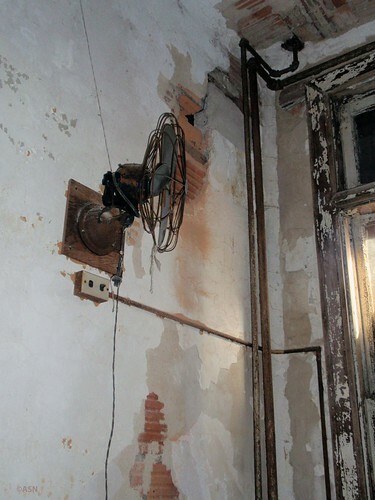 Here visitors can gaze down onto the remnants. It’s hard not to be reminded of Venturi Scott Brown’s ghost outline of Ben Franklin’s house in Franklin Court just down the street, which also provides glimpses of ruins below. Venturi Scott Brown’s quiet monument has none of the gizmos and not nearly as much of the controversy (though it does entertain some) and leaves interpretations up to the visitor. Most visitors to Ellis Island only get to see the Ellis Island Immigration Museum. I was fortunate enough to go on a hard hat tour of the island's south side, which is not open to the public, and explore newly stabilized structures including the new ('new' as of 1934) ferry building and part of the old South Side Hospital Complex.